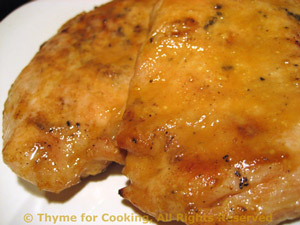 Thyme for Cooking easy recipes: Grilled Teriyaki Orange Turkey Cutlets. Cleaning out the fridge marinades.... If you don't have orange marmalade use orange juice; we won't be using the orange marmalade again this season. This is a slightly hot, slightly sweet marinade that goes well with the mild taste of turkey. Whisk together all ingredients (except turkey). Spoon over turkey and let marinate for 10 - 15 minutes. Remove turkey from marinade and cook on barbecue grill for 4 - 6 minutes per side or until done, basting with marinade before turning. 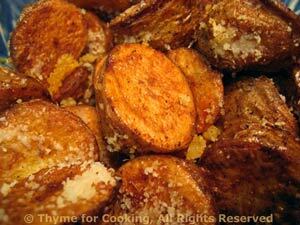 Thickly sliced, then fried in oil. 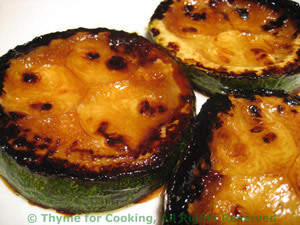 The Teriyaki sauce added near the end forms a wonderful glaze.... Another variation for zucchini. Add zucchini slices and sauté 8 - 10 minutes. Check after 8 by lifting up with tongs and looking at the bottom; it should be getting brown spots on it. If not, sauté some more; if yes turn and sauté the other side. The other side won't take quite as long. When they are done, or very close, add the Teriyaki sauce and turn all the slices to coat both sides. Continue to sauté another 1 - 2 minutes, until Teriyaki sauce has formed a syrupy glaze. Remove and serve.